Every progressive society is built on justice, equity and fairness but when societies are styled after George Orwell's animal farm the resultant effect is anarchy. Nigeria under this lopsided government of Buhari is a typical state under the heavy influence of disorderliness that demands immediate disintegration as a healing therapy. Instances to this are legion. Prior to Buhari's ascension as the president most of us with insight preached against his presidency based on his antecedents but we were seen as mere haters and shoved aside as wailers but today we have been vindicated. Nigeria has never had it this bad. Apart from the fact that life is unbearably hard with Naira hitting all time high at N410 to a dollar the activities of Buhari's kinsmen in the guise of Fulani herdsmen calls for a serious concern made worse by his conspiracy of silence. We cannot claim to be one while a particular tribe continue to lord it over us simply because their tribesman is at the helm of affairs. So many innocent lives have been wasted by these miscreants. Just last week 8 people were burnt alive in Zamfara as a fall out of a man said to have blasphemed against Mohammed and Islam. Just yesterday many people were slaughtered in Nkanu LG of Enugu State by these president's kinsmen. These are apart from uncountable atrocities committed in the past by these miscreant sons of the Futa Jalon. It appears as if Buhari's presidency is a licence for his kinsmen to slaughter innocent citizens. This brings me to the case of Joachim Chinakwe which typifies government aided injustice by Buhari's kinsmen against one of the most hated tribe in Nigeria. Today Chinakwe is facing jail term for naming his pet dog Buhari which Buhari kinsmen found offensive. However, during the time of Jonathan a certain fulani man wrote "My name is Goodluck Jonathan" on a placard and hung it on the neck of his goat and took it around and yet no arrest was effected. Even recently a certain policeman went and hung Jonathan's portrait on tree while his wife is seen crying beside it yet this same overzealous police force didn't think it necessary to arrest the stupid police officer. In the case of Chinakwe, when the matter was brought to the police they arrested him for three days and later released him but rearrested him again on the premise they were protecting him from being lynched to death as a result of the death threats against him. The question becomes why police would allow the people that made a death threat on someone to walk freely while arresting the victim of a threat. The reason cannot be farfetched. They are Buhari's kinsmen who are licensed to cause any degree of mayhem and go scot free. Nigeria is currently under the mercies of Buhari and his kinsmen who are empowered to toy with our lives as they desire. Democracy, rule of law and constitutionally established federal character are long dead and buried under Buhari's administration. In fact recent happening has shown that Nigeria is all about Buhari and his fellow northerners especially the core Muslim North. Recently John Kerry, the American secretary of states, visited Nigeria and only met with Buhari, the sultan of Sokoto and then the 19 northern governors. If this did not convey a message of the extent to which sectionalism has been enthroned in our body polity, I don't know what else would have shown that. Nigeria is very sick, diseased and needs urgent medication and that medication is disintegration. Buhari has a known history of selective vindictiveness, therefore what is happening today is never accidental. He purposely came to fulfill the long awaited quest of the Fulani oligarchy and which are complete islamisation and northernisation of Nigeria. Some southern fools will always argue their possibility but let me quickly remind those people that Egypt and Turkey were once predominantly Christian nations but today they are predominantly Muslim nations with 10% Christians in Egypt and 0.4% Christians in Turkey. Buhari is gliding towards a repeat of Egypt and Turkey experiments. The only solution, I repeat, is total disintegration of the component parts that constitute the Lord Lugard contraption. Nigeria is long overdue to go it's separate ways, therefore any effort towards achieving this venture is one in the right direction. Beautiful article Sam. You got it so well together. Our people are still very naive and that is taking us to the abyss if we don't raise a standard against this monstrous agenda. We've never heard Fulani herdsmen kills people in the history of Nigeria until Buhari the satanic moron assumed power. American conspiracy is working full time in Nigeria. We can take all of them down if we can get it together now and do it once and for all. DISINTEGRATION is nothing but the 1 ☝ and only right medition to the detrimental impediment choking up the zoo Nigeria. The U.N , A.U, E.U, and the concerned world bodies who together sign in the RIGHT TO SELF DETERMINATION should not wait to give us BIAFRA because we'll not relent achieving THE RESTORATION OF BIAFRA if they think we're joking. So it is better for the to initiate and administrater DISINTEGRATION now the zoo Nigeria is on a free fall before it hits the ground. If it does that, then nothing will live in that zoo, not even an ant. We'll nuke and crane that zoo out of the surface of the EARTH. DISINTEGRATION is nothing but the 1 ☝ and only right medition to the detrimental impediment choking up the zoo Nigeria. The U.N , A.U, E.U, and the rest of the concerned bodies who together sign in and enshrined the "RIGHT TO SELF DETERMINATION" should not wait to give us BIAFRA because we'll not relent achieving "THE RESTORATION OF BIAFRA" our beloved heritage. 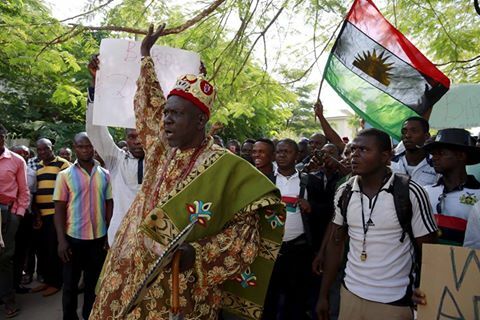 And if they think we're joking they keep on playing around with BIAFRA RESTORATION and watch the outcome. It is better for the U.N, A.U and concerned world bodies to initiate and administer this meds DISINTEGRATION to the zoo Nigeria it is on a free fall before it hits the ground. If they delayed this, then nothing will live in that zoo, not even an ant. We'll nuke and crane that zoo out of the surface of the EARTH as hunger will be significant.